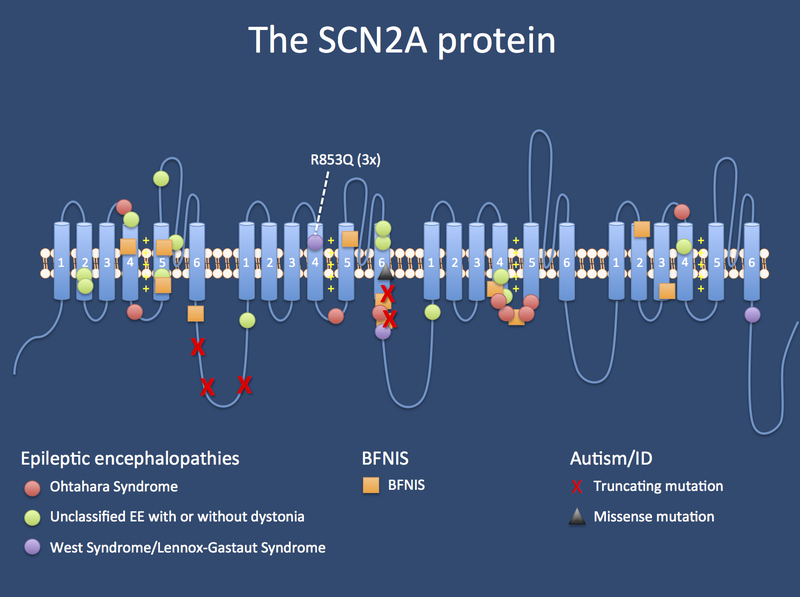 The story of SCN2A. Pathogenic SCN2A variants were first described in patients with autosomal dominant benign familial neonatal/infantile seizures (BFNIS) in the early 2000s. More recently, it has became clear that variants in SCN2A can cause a wider spectrum of epilepsy phenotypes, ranging from milder phenotypes, such as BFNIS, to severe phenotypes, such as infantile spasms and severe early onset epileptic encephalopathies, including Ohtahara syndrome and West syndrome. In addition, SCN2A variants have been identified in a small number of patients with autism, schizophrenia, and intellectual disability without seizures. Despite now having earned its title as a well-established epilepsy gene, we still have a lot to learn about SCN2A. Keep reading to learn more about the expansion of the SCN2A-associated epilepsy phenotype and other recent discoveries about SCN2A. The complexity of SCN2A. Our understanding of the SCN2A-associated phenotypes continues to expand. Here are some of the highlights of what we have learned about SCN2A within the last 8 months. SCN2A and MPSI. Howell and colleagues identified pathogenic SCN2A variants in seven patients with migrating partial seizures of infancy, showing that the frequency of SCN2A variants in this subtype of epilepsy may be higher than previously known. SCN2A and fever-related encephalopathies. Saitoh and colleagues reported two patients with SCN2A missense variants who presented with acute seizures during infection followed by development of acute encephalopathy with biphasic seizures and late reduced diffusion (AESD). The pathogenicity of at least one of the reported variants has been called in to question due to its frequency in the control population. SCN2A and late-onset ataxia. Schwarz and colleagues reported several additional patients with SCN2A variants presenting with neonatal onset seizures that improve in childhood followed by later development of episodic ataxia in early childhood between the age of 1 to 4 years. SCN2A and schizophrenia. Carroll and colleagues reported a novel loss of function SCN2A variant in a single patient with schizophrenia. This is the 2nd patient with schizophrenia identified to have a rare novel SCN2A variant, continuing to support the possible role of SCN2A in schizophrenia. SCN2A and genetic modifiers. Hawkins and Kearney recently showed that Hlf (hepatic leukemia factor) can modify the epilepsy phenotype of an SCN2A mouse model, strengthening the theory that genetic modifiers are involved in determining the phenotype of patients with SCN2A variants. Thus, recent discoveries further support the complexity of SCN2A phenotypes, but may provide some insight into potential modifying mechanisms. More SCN2A updates. Visit our SCN2A gene page to learn more about other updates on what’s new with SCN2A and take a look at the additional topics that we have added with our revised gene page content, including sections on the clinical perspective, animal models, references, and research. This entry was posted in 2016, SCN2A, Updates. Bookmark the permalink.